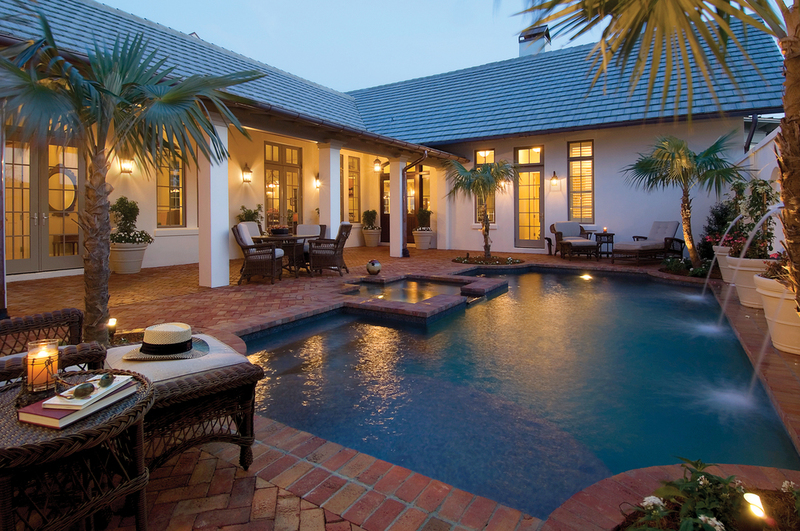 The Magnolia is a breathtaking new custom home located in Sarasota, Florida. This stunning courtyard design luxury single family home designed by renowned custom home architects Cooper Johnson Smith exemplifies flawless traditional design and clean lines. This striking residence reflects a Low-Country look, with exemplary touches like copper gutters and flashing, beadboard soffits, vaulted ceilings, hardwood flooring, real brick pavers and more. Owners are greeted by a breathtaking courtyard pool surrounded by a real brick paver deck, fountain and detached guest house. Through a custom hardwood door is a family room with vaulted ceiling with antiqued beadboard trim. The gourmet kitchen serves as a backdrop and social hub to the family room, with twin islands wrapped in cabinet grade trim, ultra premium appliances and custom hardwood cabinetry. A delightful living room and dining room are separated from the kitchen by a well appointed butler's pantry including a wine bar and stemware dishwasher. The vast owner's suite awaits with vaulted ceiling and a French door to the breathtaking rear lanai, summer kitchen, outdoor fireplace and garden. Just past the Owners' wet bar and walk-in closet is the luxurious Owners' Bathroom with split vanities, deck tub and cavernous walk-in shower.